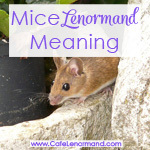 When you first begin reading Lenormand, it can be confusing when cards have overlapping meanings. Such as the Fox and Moon for work and the Tree, Key and Cross for spirituality. 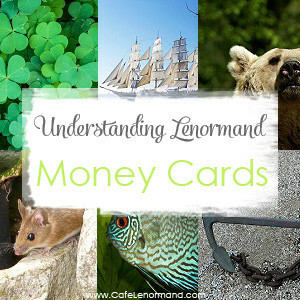 Even money and other financial matters can be confusing with the Clover, Ship, Bear, Mice, Fish, and the Anchor all coming into play. It's clear that these cards are related to finances, but exactly how do they differ? 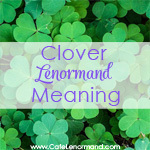 Normally, the Clover represents luck, risks, and good fortune. However, it also reveals gambling and unexpected money. Any money gained tends to be small amounts, and probably less than you were hoping to receive. Think $100, not $1,000. Just as a Clover isn't long-lasting and fades with the seasons, any money you receive tends to be just as fleeting. When you look at the Ship card, what comes to mind is probably travel, a journey, adventure, or even great distance. 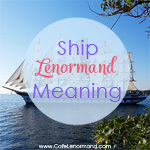 But I want you to think about ships when Lenormand was created. What were ships used for in the 1800s? They represented an opportunity to start afresh in another land. They were a chance to discover new lands and the wealth that went with them. Most importantly, they were an important means of trade and commerce. Thus, when it comes to finances, the Ship can indicate money coming in from a venture, trade or commerce; money from overseas; and financial opportunities. The Bear is the card you look at whenever you want to know about an individual's or a company's financial situation. For an individual, the Bear is your personal finances – your income, investments and other personal assets. It's not just your salary, but what you're doing with it. For a business, the Bear represents accounts payable and receivable. Depending on surrounding cards, it can be a big, cuddly bear filled with great prosperity and comfort or a bear that's been hibernating for the winter and in desperate need of a snack – some hard cash. However, on its own, the Bear shows good fortune in finances. When it comes to finances, the Mice are busy gnawing, eating and stealing. They're causing you expenses that can quickly increase. They may be causing you concern that money is going out faster than it is coming in. You may be worried that you won't be able to pay your bills or other financial obligations. They may indicate theft. Someone around you may be taking money from you – an employee, an adviser, or someone close to you – usually a small amount of money here and there that adds up over time. Yet, the Mice could just as easily be pointing to stinginess and hoarding, holding onto money as tightly as Ebeneezer Scrooge. You may have a nice sum of money, but you're afraid to spend it. 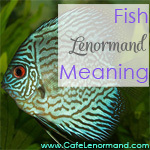 The Fish is the primary Lenormand money card. It's the card you want to focus on first in financial questions. It covers both finances and business. The Fish represent your overall wealth and abundance. It's more than just cash flow. It's your total financial situation. It's a card that can indicate someone with great wealth, such as a millionaire or billionaire. For businesses, the Fish covers a bit more. It represents sales, purchases, exchanges, import/export, trade, commerce, joint ventures, consultants, business owners, and entrepreneurs. It shows how profitable your business is and how you can increase your revenue. 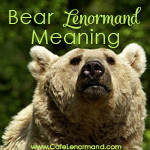 Note: For Lenormand beginners, there can be some confusion about the differences between the Bear and the Fish. The easiest way I can think of to describe it is that the Bear is about your personal financial security. The Fish involves actual money and finances, as well as business. More simply, the Bear card is strength; the Fish card is money. 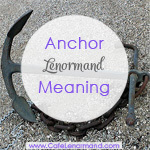 The Anchor normally represents reaching your goals and arriving at a destination. It's a safe harbor where you can live with the faith that everything will be okay. For wealth and money, the Anchor is a card of stability. It shows how lasting and secure your finances will be. It can also represent long-term investments. I have no words to thank you girl! Would love to buy your blog as a book.. Thanks! I hadn’t thought about making it available as a book. I’ll have to look into it.